This example demonstrates how to read from an excel file in Java using the ExcelDocument and ExcelReader classes. The demo code reads an excel file and displays its contents in the standard console. However, the contents of the excel file may be sent to other output types like CSV, Xml,Database,etc. There are other examples which demo how to write to an excel file. An ExcelDocument is created corresponding to the input file. 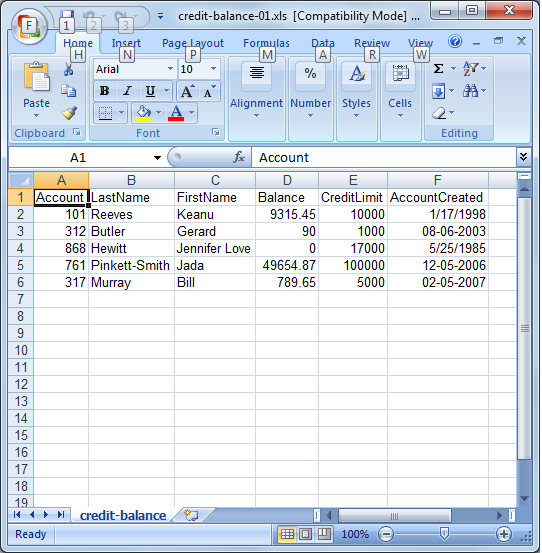 The input file is opened via ExcelDocument.open method using the file path of the input file credit-balance-01.xls. A new ExcelReader is created and opened via ExcelReader.open. Each row in the excel sheet is read as a Record object and written to the standard console via the datapipeline logger. After the while loop completes, the ExcelReader is closed via reader.close method. ExcelReader is an input reader which can be used to read an excel file. ExcelDocument is a class that encapsulates an excel document. Normally, when CSV or other types of files are read, the input file is opened directly via the reader class. For ex. you can refer to the read a CSV file example. However in the case of excel documents, the files need to be opened/saved via ExcelDocument class. ExcelReader is used purely for reading the excel file. ExcelReader has a method setSheetName which can be used to set the name of the spreadsheet in the excel document. The ExcelReader.setFieldNamesInFirstRow(true) method can be used to specify that the names specified in the first row of the input data should be used as field names. If this method is not invoked, the fields would be named as A1, A2, etc. If those fields names need to be changed, a rename transformation can be added on top of ExcelReader or any other type (Refer Rename a field for example).